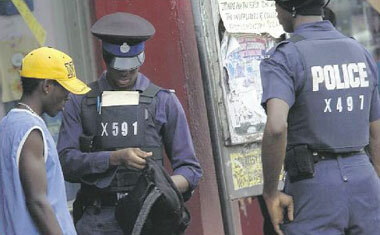 Police officers check the contents of a man's bag in downtown Kingston yesterday. The winners for October 31, 2005- December 05, 2005..
Caption: Welcome to Jamrock!! It inna yu hanbag yu knapsack it inna yu back pack! Caption: Officer: Mi give yuh $50 fi de bag youth! Time spent in prison fi yuh spliff timeless. Caption:(Officer Searching the Bag) Hmmm, Fried plantains, stew chicken, curry goat, stew peas and rice, soursop juice...how so much food inna dis likkle bag? (Officer on the right): ..and him dont even have nuh ackee and salt fish...lock up di bwoy!! Caption:Fashion Police inspect youth's handbag accessory and declare: Wa ya do wit a ooman's bag dey? Thank you for the 221 responses we received. Enter again and we hope you will be the outright winner next time.